The interest in showcasing amateur athletes from all nations in the Americas of the Western Hemisphere led to the creation of the Pan American Games. First held in Buenos Aires in 1948, the games quickly became the venue in which future Olympic champions were given their first taste of international competition. The third edition of the Pan-American Games was held in the Chicago, Ill., during the summer of 1959. Eighteen nations participated, but the events were dominated by the U.S., which won a total of 236 medals to easily eclipse runner-up Canada’s 48. One of the highlights of the ’59 Games was certainly the U.S. Men’s Basketball team. Composed of all the best college players around the country, Team USA featured two future NBA superstars, Oscar Robertson and Jerry West. Robertson led the way, averaging 16.5 points per game as Team USA ran through six nations, beating each one by a 40-point margin on their way to the Gold Medal. Robertson, West and several other Pan-Am Games teammates would form the nucleus of the squad that would take gold at the 1960 Rome Olympics a year later. 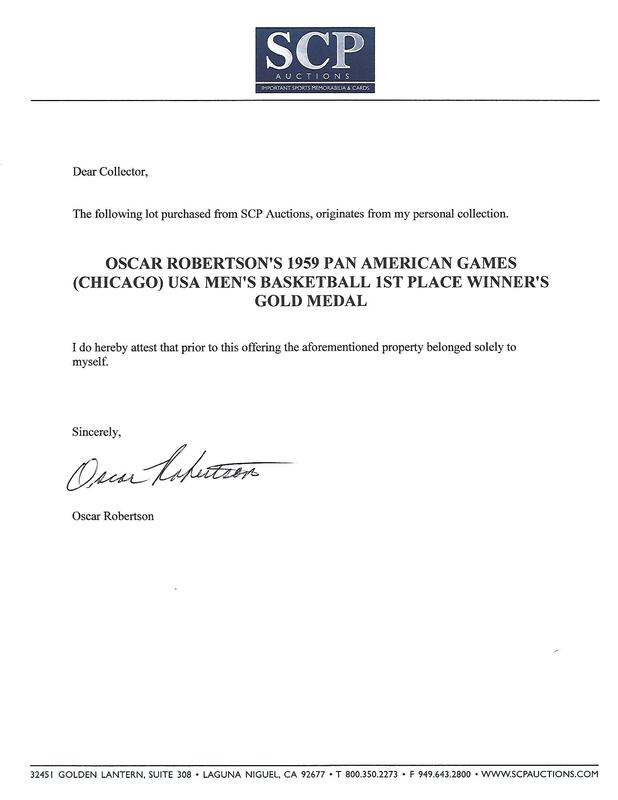 Featured here is the Gold Medal presented to Oscar Robertson following his team's triumph at the ’59 Pan-Am Games. 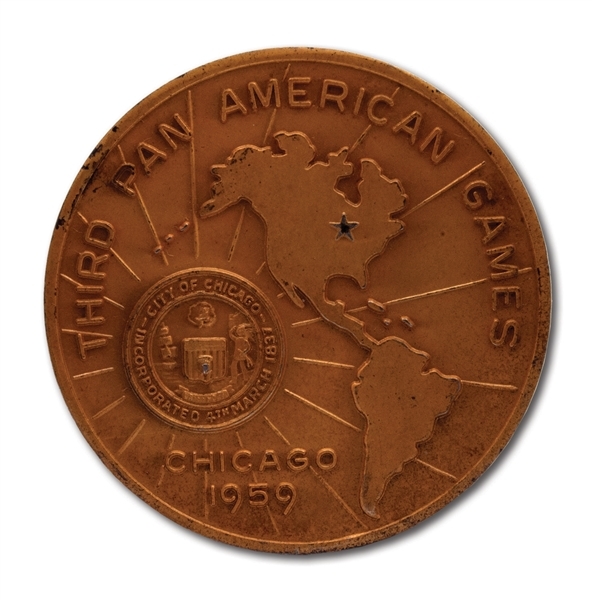 The obverse reads "THIRD PAN AMERICAN GAMES" around the top with a map of the Western Hemisphere and a silver star marking the location of the Games. At the bottom is "CHICAGO 1959" in raised letters and numbers with a ciircular design of the U.S. Olympic team emblem surrounded by "City of Chicago Incorporated March 1837". 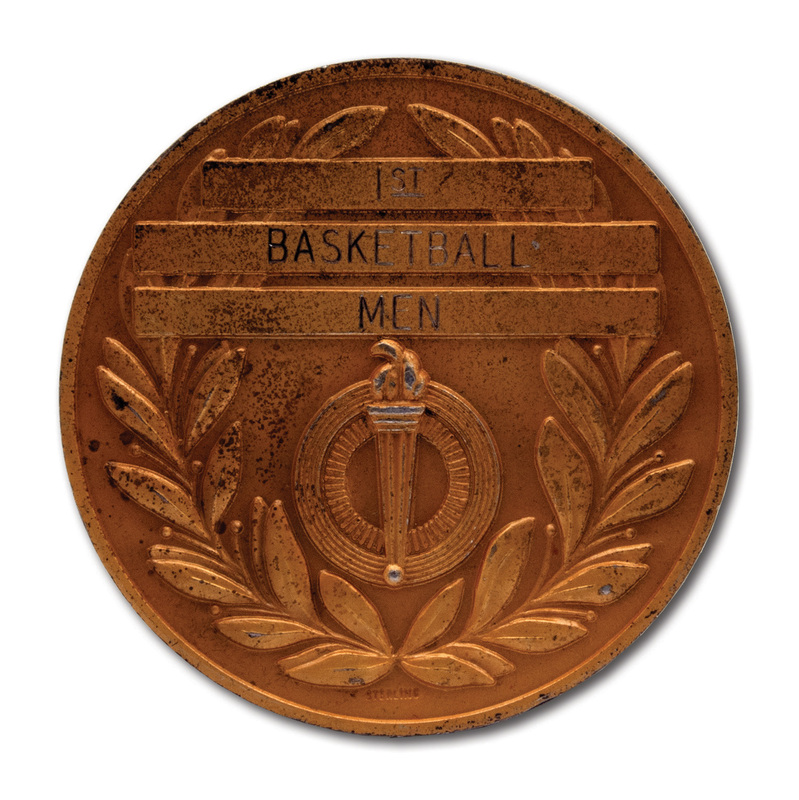 The reverse depicts a torch and laurel wreath with "1st - BASKETBALL - MEN." Made of gold-plated Sterling silver (hallmarked on the reverse with "STERLING" at the bottom), the medal measures 51mm in diameter and 3mm thick and weighs 70 grams. The rim and edge show some wear and tarnishing, but overall it remains in very fine condition. A shining example of Oscar Robertson’s first foray into international competition when his legend was just getting started. Includes LOA from Oscar Robertson.